A recent study published in the Proceedings of the National Academy of Sciences (PNAS) indicates that chimps may be more evolved than humans. While this development may have little impact on current science, it contradicts the anthropocentric view of the world, which views humans as the pinnacle of evolution, and the de facto owners or rulers of the earth. Of course, such a view is strengthened by the Judeo-Christian view that all of creation was made for man, and that man was given dominion over the creation. However, certain liberal mainstream Christian churches, who were already concerned about the environment, are using this new bit of data to go to the next step – serving the chimps. Rev. Ima Postate, Wiccan priestess and pastor of the First Episcopalian Church of Pattersonville, California, rejoices in this new bit of science. Naturally, hardliners in the church refuse to move along with what the science has clearly shown, and, stuck in their anthropocentric view (they probably believe that the sun revolves around the Earth too! ), are threatening to split off from the church unless the man-centered services are left functioning. “We wholeheartedly disagree with this change of direction. Not only does it contradict the Word of God (TM), but we recognize that thousands of people who live on simian meat in foreign countries would go hungry if this perspective were adopted” responded Rex Terra, who is leading the opposition. To publicize their disagreement with the Pastor, opponents are sponsoring a chimp-fry next weekend, and will be serving barbecued chimp to the homeless whose programs are scheduled for closure. Pastor Postate has been trying to reason with the opposition, but they seem resistant to any compromise or discussion. This potential church split is going on in more than one church in America. Many other churches are splitting between the conservatives and the eco-friendly parishioners, between those who hold to outdated views of the value of humanity and those who respect science and reason. What was the point of that, exactly? Well, it’s my first shot at satire. The point is to point out what I find wrong with the liberal churches, and evolutionists to boot. Perhaps I was not that effective. 5. evolutionary theory really is a silly, worthless world view, not only for science, but for philosophy and ethics – that is, when you translate it into other disciplines, it integrates with heinous and ridiculous thought systems, mostly because it is one of them. But I hate spelling it all out like this. Satire is supposed to be like poetry, it’s supposed to be subtle and open to interpretation. I think this would only have been clear to someone who already agreed with your points. Content aside, I did like the self-portrait you posted, seeker. Be careful, that’s not a toy I’m packing there. I can use those opposable thumbs, baby. 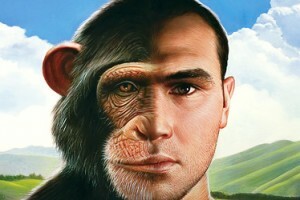 That must be on a good day when you are in the Chimpanzee state of evolution. LOL. Seeker explains Why Earth should be the Planet of the Apes….